← Day 50: Vegan Baking Workshop. What’s funny (at least to me) about today’s post is that a long-time dear (I refuse to say old) friend of mine was in town on business. We met up with some colleagues of hers for a couple of happy hour drinks, before heading to the Total Health Show at the Metro Toronto Convention Centre. I’m fairly certain we were the only tipsy ones in there. See? Life is just one big wheel of cheese. Now, don’t get me wrong, I’m a fan of trying to lead a healthy existence. I try to practice yoga on a quasi-regular basis, I walk just about everywhere I go, and I don’t eat meat; however, I can’t go more than a few days without wine, cheese, dark chocolate and seafood. Not to mention fries, and the spongy goodness that is bread. I mean, why would you want to? 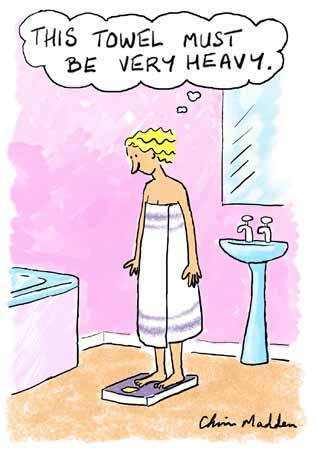 Life is about balance, and I truly believe that Mom was right when she said ‘everything is fine in moderation’. At least, I think that’s what she said… Or maybe that was Oprah? But I digress. Again. 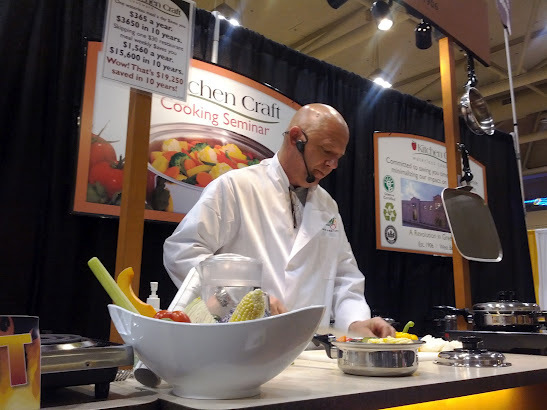 Back at the Total Health Show, this was the first time in its 34 or so year history that I attended it, and we were starving, so after finding the loo, we were lured into a cooking demonstration by being handed a bowl of freshly chopped salad with yummy dressing. We soon discovered that it was a promo for Kitchen Craft, reportedly the best cookware in the entire world! I will dazzle them with my chopping skills! Unfortunately for the charming and patient man working the crowd, neither of us was in the market for new pots and pans, so we ate our freshly cooked samples, and skulked off to quickly explore what the rest of the show had to offer. And we were not disappointed. My buddies at Fresh City Farms were there with quite a sizeable booth display. They were next to the central food area, where we sampled a Mexican cold chocolate drink. Yes, it was as good as it sounds. We also loaded up on some Canadian made and tasty granola bars, plus some maple coated nuts that were incredibly delicious! By then, we were getting close to the 9 pm show closing time, which is the golden hour when vendors start discounting whatever food they have leftover. One rather large plate of Indian food from Govinda’s? Don’t mind if I do. Cha-ching! 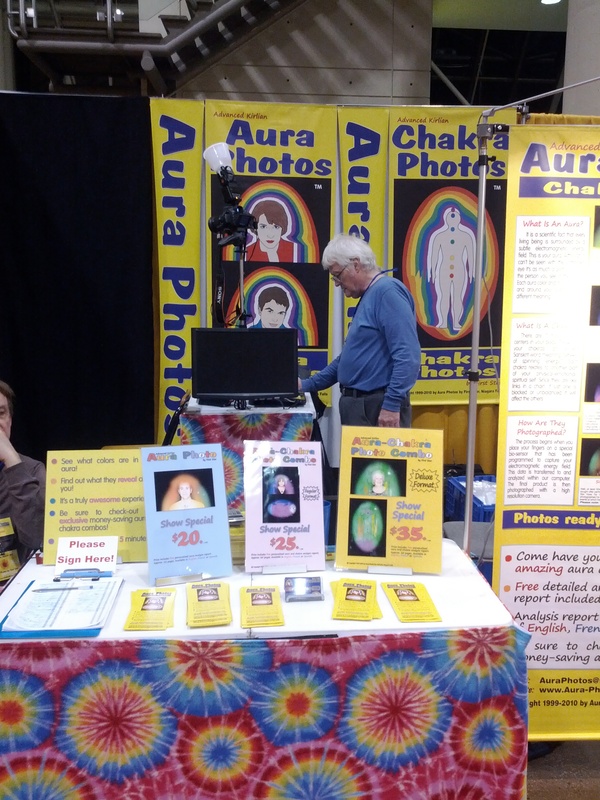 The remainder of the walkabout unearthed some rather rare gems, like the booth that touted the opportunity to have your auras and chakras photographed. Oh, so tempting… Another offered, well, I’m not really quite sure what, but it had invisible pyramids no doubt giving off all kinds of healing energies. 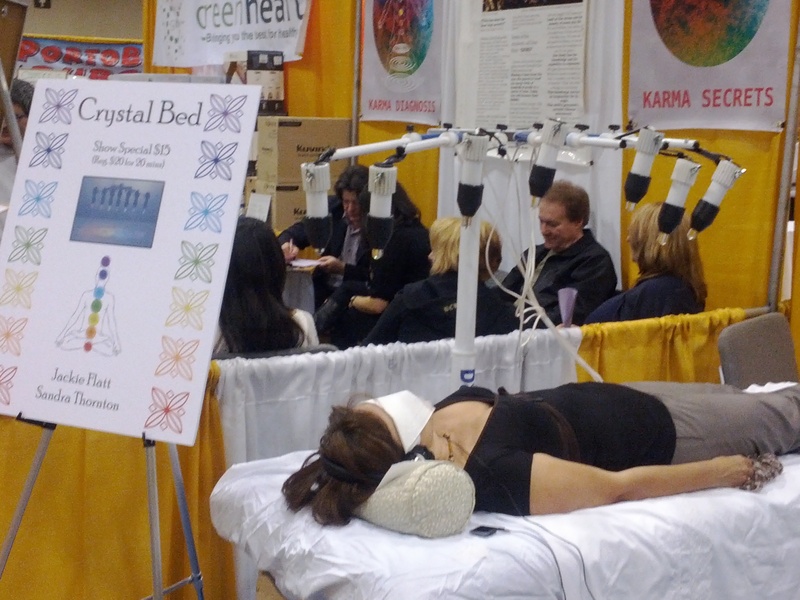 Plus the ubiquitous crystal bed. I mean, who doesn’t have one of those? Okay, so maybe I was just in a bit of a giggly mood, but if you can’t laugh at yourselves, then frankly, you’re doing it wrong. Part of total health in my view is enjoying life to the fullest, and being happy. So lighten up! In any case, it’s Friday, and tomorrow will bring an entirely new meaning to things looking up… Stay tuned! Your aura is worth a thousand words. This is not the $25000 pyramid. I thought you said crystal meth? 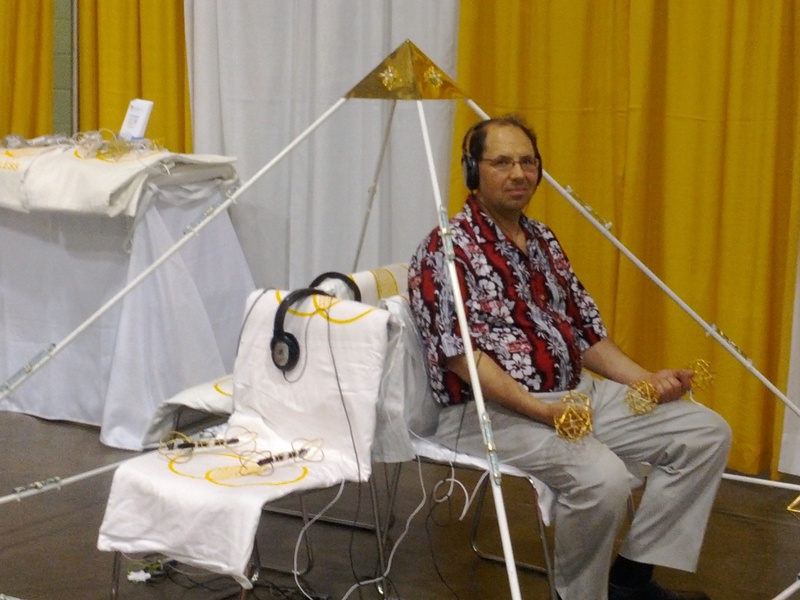 This entry was posted in Health and tagged April, Toronto, Total Health Show. Bookmark the permalink. 2 Responses to Day 51: Total Health Show.